For 10″ to 24″ displays. The SmartMount® Pivot Wall Arm is ideal for applications that require easy side-to-side swivel and tilt. This single link arm extends out 7″ and provides easy one-touch tilt for limitless viewing positions. Its anodized aluminum finish complements offices, conference rooms or any room in the home. 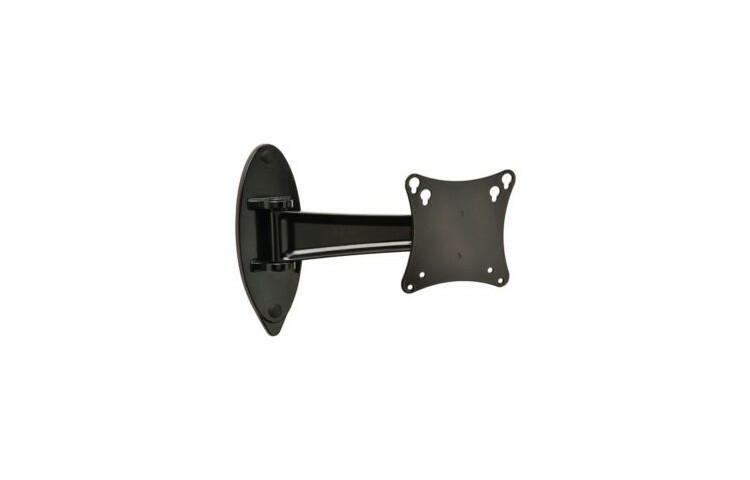 For easy installation, this mount comes completely pre-assembled with all necessary mounting and display attachment hardware. Two tension able pivot points for virtually limitless adjustments. ±35° of tilt and ±7° of roll for flexible viewing positions. Offers up to 90° of swivel. Anodized aluminum finish in black or silver. Includes hardware for installation to a single wood stud or concrete. Non-VESA adapter plates available (sold separately).